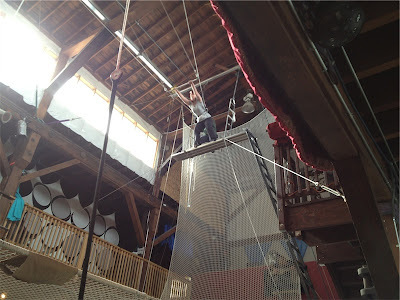 That was almost a year ago exactly, when I bought a Groupon for a two-hour trapeze class; the day I went insane. Two days ago, I proved I hadn't yet recovered my sanity as I made the call to schedule the class. 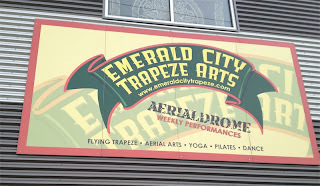 And this afternoon, I rode the light rail down to the Emerald City Trapeze School. I can't remember the last time I was so nervous, but wicked excited too! Signing the waiver I had to talk myself down from backing out. Getting ready for this class was the reason I've kept going to the gym all year, even when I didn't want to. No way was I backing out now! My first look at the net. Oh my! 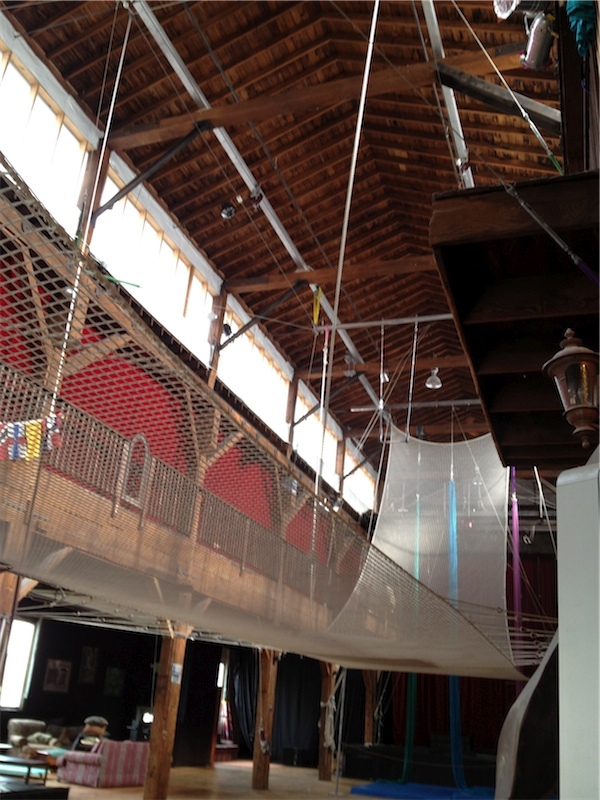 They started us out on the ground with a hanging bar we could reach with only a little jump, thank goodness. There we tried out our 'routine' for the first time. We were supposed to wait for the call before doing each step. Luckily we weren't being graded! I'm so glad we got to try things out there first! We had seven first-time flyers and three instructors for our class (max is 12 students). It was a family of four, a mother/daughter duo, and me. After the 'ground school' lesson each of the instructors took their posts: one climbed the ladder up to the platform, another grabbed the rope that would keep us from falling, and the third manned the ladder, getting us hooked up to the guy lines when it was our turn to go. I have to climb that? 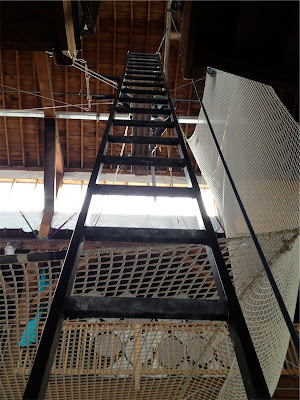 Standing at the base of the ladder, the platform sure looked like it was a long ways up! To make it easier, they did clip us into a guy line before we climbed. 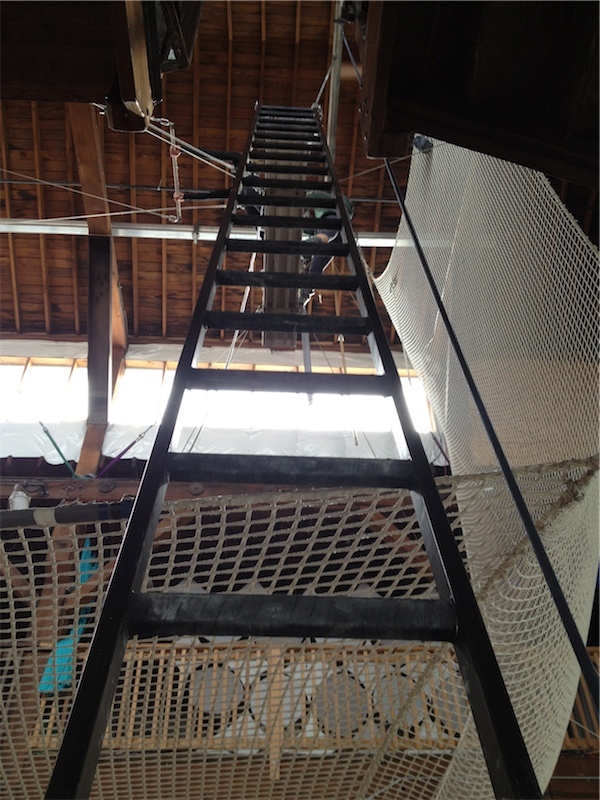 Once I made it to the top, I still had to step around some tension lines, after which the spotter swapped out my single guideline for a pair, one on either side and brought the bar in 'close' so I could grab it. Close being a relative word when you have your toes curled over the edge of the platform and you have to arch your body out into thin air to grab the bar with your right hand while holding onto a support with your left. To be fair, the spotter had a very firm grip on my belt and was using her weight as a counterbalance, but it didn't feel safe. I honestly did not think I could remove my left hand to reach for the bar. Bless the spotter; when gentle encouragement didn't work, she shouted at me; that I could do it. And what do you know - I did! The routine was supposed to go as follows (with instructions called from below reminding me of a bizarre square dance): Swing out, bring your legs up (meaning through the space between your arms and the bar, hitch your knees over the bar and point your toes. Really.) Swing back. Release your hands (and let your body fall back into air). Swing. Grab the bar again with your hands, release your knees, then kick yourself into a backflip dismount. I did it! I really did! I ended up taking four separate runs at the routine. The first time, I could NOT get my legs up, and I was shaking so hard with adrenaline afterwards, I didn't know if I could continue. Luckily, the time it took for the others to go gave my body time to settle. 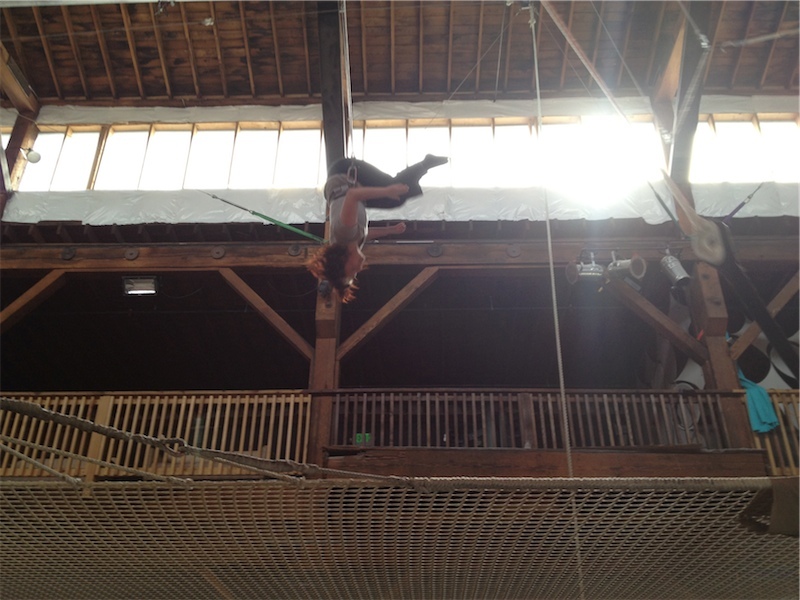 And the next time I did it; I swung from my knees high, high above the ground. I may have been the most ungainly trapeze flyer ever, but hey: I did it! Everyone else got to do a transfer; I decided I'd better wait until next time. Next time, you ask? Yep, they offered a two-for-one deal. If you signed up for another class before you left, you got a third free. I've signed up; figure it will likely take that long before I'm ready to do a transfer. Next class is April 21. That gives me a little over a month to work on my core strength, which is what it turns out I need. My arm strength surprisingly was fine, but at this point I can only lift my right foot about 3 inches off the ground; my right front hip flexer is sooo tired. Won't be surprised if I walk with an odd hitch in my gate tomorrow. But what a motivation to keep visiting the gym! My brother, sister and their kids are all supposed to be coming to visit this summer. 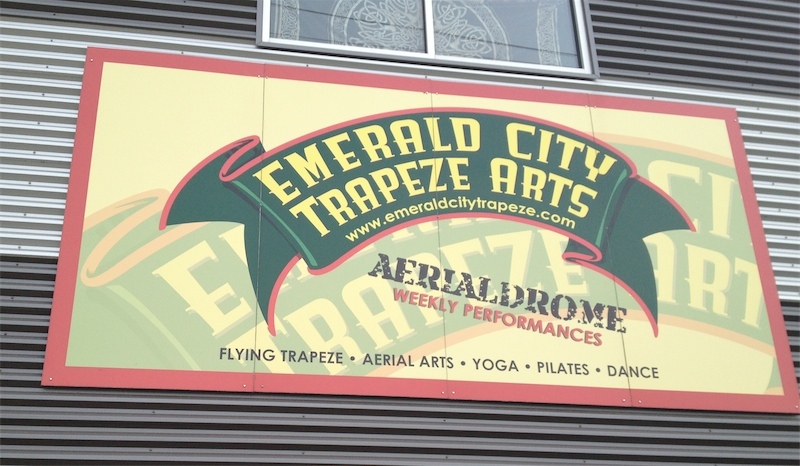 Wonder what they'd think of a trapeze class as part of their vacation? Kids as young as six are allowed, though you have to be twelve to do the transfer. You are my newest hero! I would have been such a chicken. I'm fine with climbing up things, but ask me to look over the edge once I get up there, and I turn to a big ol' lump of jello (makes me real popular when we hike up mountains). Good for you!! wow,you are brave! and to sign up for 2 more is even more impressive. looking forward to reading about what happens next month. 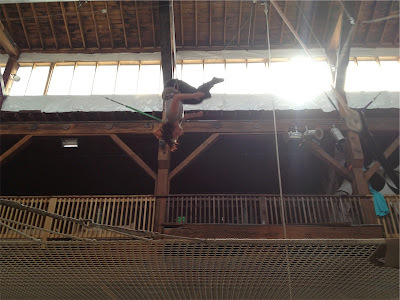 Here's a video of someone I know using a hula hoop on the trapeze: http://www.youtube.com/watch?v=XkRnE61skJE Crazy, huh? What a great tale to tell. Congratulations that was quite an accomplishment. Have a great time on your next two classes. Did I mention I've always had a fear of heights? The good thing was once I jumped from the platform, everything happens so fast and I was trying so hard to do as told I didn't have much room left over for fear.